The IRI-S has been designed with the ability to have a reading area in the clear lens. 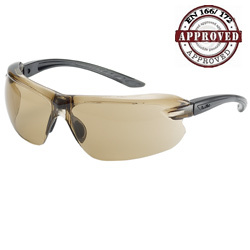 They also have a "memory form" nose pad for added comfort as well as especially adjustable non slip temples. Often highly adjustable glasses do not look very desirable but Bolle have managed to create a great looking, full wrap-around design with these adjustment. 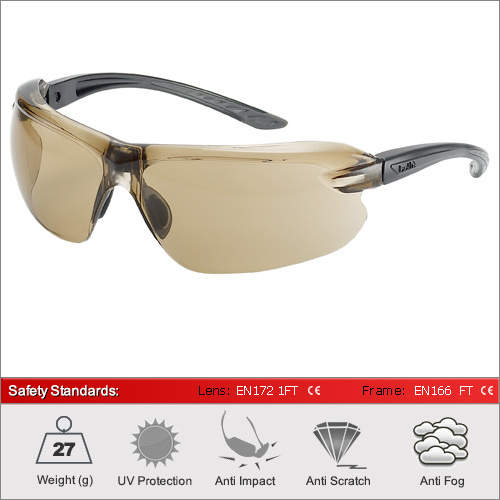 The optical quality 1 lenses has an anti-fog and anti-scratch coating. We have 7 lenses available in this frame. The clear lens for 100% optical quality 1 performance. The Smoke lens for direct sunlight and other bright light conditions and the twilight lens for low light conditions outdoors. In the clear lens version the reading glass options are +1.5, +2, +2.5 and +3 For a full explanation of the different lens types and their ideal usage please see our dedicated Lens Advice Section.